Tomorrow, May 3rd, is the showdown date! It is the day us SONEs has been waiting for since the release of ‘Twinkle’! 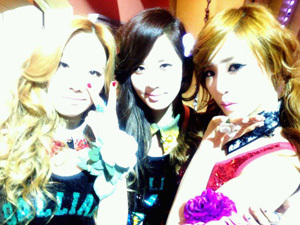 It is going to be TaeTiSeo’s debut stage on M!Countdown where they will be performing ‘Twinkle’ and ‘Baby Steps’! Tiffany: Neh, where are we at now? Taeyeon: It’s our MV’s filming studio. Tiffany: And weights on our shoulders. Seohyun: That’s right, 9 of us used to fill up the stage, now that we have 3 people, we will work hard with a sense of responsibility in mind. Tiffany: We will fill the stage with our loud voices. It is your promise to keep going ahead from that day when your dream began. Stir up some wind and waves to sail through the impossible. Now you have come this far, heading for where your dream is. Just let’s raise the voice at the gate of the world and show them the power of Twinkle, ^^ hehe. one, two, three, Go! My love, the story has just started, just don’t let yourself stop now yea. Great Beauty hwaiting! Tiffany and Seohyun hwaiting!! SNSD jjang! LOL AT THE EPIC BRIGHTNESS!!!!!!! MILKY SKINNED TAENYHYUN aka KIM FAMILT HWAITING!